BPro® Cardio Pulse-Wave Device is a non-invasive screening for the masses that is 99.17% as accurate as the invasive angiogram method. It is also much quicker - typically less than 30 minutes, and costs just a tenth of the price of a standard angiogram. There is no need to attend hospital as this Cardio Pulse-Wave screening can be conducted any where, including your home or your workplace. Having an understanding vascular health is vital for your long term health. The screening and testing that is needed to glean this information, however, has been unavailable to most general practitioners and patients due to the inconvenience and the cost of the standard and invasive angiograms that, until recently, has been the only way to get this information. Cardio Pulse-Wave (CPW) Technology is the latest technology in non-invasive vascular and cardiac screening. This new technology measures Central Aortic Systolic Pressure (CASP) and radial Augmentation Index (rAI) with clinical accuracy. This can help identify cardiovascular risk and arterial stiffness far better than standard brachial cuff pressure and provides critical information for you that can help you identify problems before they become dangerous and/or life threatening. 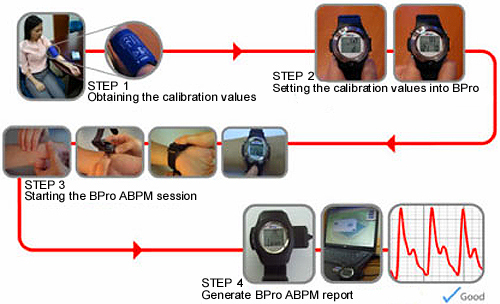 What Does the BPro® Cardio Pulse-Wave Device Do ? The Cardio Pulse-Wave device (BPro®) gives you two printout readings that help you assess your cardiovascular health. Firstly, a 24 hour macroscopic view of vascular patterns, including blood pressure, heart rate, mean arterial pressure, and pulse pressure. BPro® is the first monitoring technology in the World that employs the applanation tonometry methodology to capture 24 hour blood pressure readings. It takes the blood pressure measurement even without the wearer being aware of it. Secondly it employs real time microscopic arterial pulse waveform analysis. 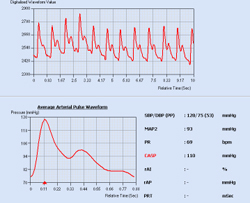 Using the BPro® and the pulse wave analysis application software, it is now possible to acquire real time arterial pulse wave data and to translate these waveforms into clinically diagnostic related indices. The Cardio Pulse-Wave testing takes 15 to 20 minutes to perform. The test is completely non-invasive, very simple, and absolutely free of any pain. The BPro® is placed on individual's wrist by means of a strap, similar to that of an ordinary wrist watch. The monitor reads and calculates a wave form signal that identifies the elasticity of large, small, and peripheral artery walls. It also tests stress, heart rate, and more. A print-out of the results of the radial screening is provided that clearly explains the level of your cardiovascular health. 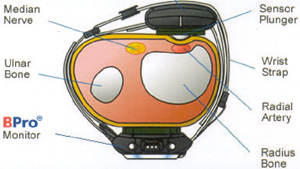 Cardio Pulse-Wave Sensor Housing. The sensor plunger sits on the radial artery over the radius bone. This patented plunger system design is hemispherical and transfers pressure forces efficiently to the internal pressure sensor. The wrist strap system is specially designed to ensure that the sensor system sits comfortably on the radial artery position. Simultaneously, together with the sensor housing, it provides constant applanation to the artery without causing any discomfort. The strap system avoids any median nerve compression. Patented by HealthSTATS International Pte Ltd this technology accurately measures Central Aortic Systolic Pressure (CASP) and is the only device approved to be used in a common clinical non-hospital setting. It has been validated via invasive study and achieved an accuracy (co-relation) R=0.9917 independently. A-PULSE CASP is FDA Certified and CE MDD approved. The Cardio Pulse-Wave is 99.17% accurate and is shown to be as accurate as the angiogram method that uses an invasive catheter through the groin area. At last there is an affordable and quick screening method that can help you take control of your cardiovascular health.